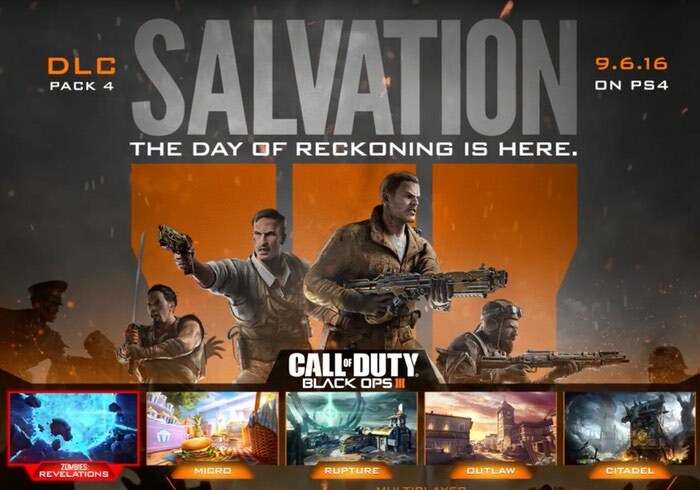 The final Call Of Duty Black Ops III DLC map pack in the form of Salvation will be available first on Playstation 4 on September 6th and will follow shortly afterwards on PC and Xbox One. Unfortunately the Salvation DLC is not available on Xbox 360 or PlayStation 3. The final and fourth DLC and map pack for Black Ops III features the culmination of the Zombies Origins saga plus four new unique multiplayer maps to enjoy. In the final chapter of the Zombies experience ‘Revelations’, the day of reckoning has arrived. The Origins characters have fought their way through multiple alternate universes to prevent the Zombie apocalypse. Finally they will learn who has been pulling the strings to control their fate. – Outlaw: A western reimagining of the fan favorite map ‘Standoff’ from Call of Duty: Black Ops II. – Citadel: An ancient, towering castle once a seat of power now sits abandoned and overgrown. – Rupture: A high-tech facility designed by a futuristic society desperate to repair the Earth’s atmosphere. – Micro: A miniaturized combat zone that takes place on a well-stocked family picnic table, that’s what.